If you have a visit to Mt. 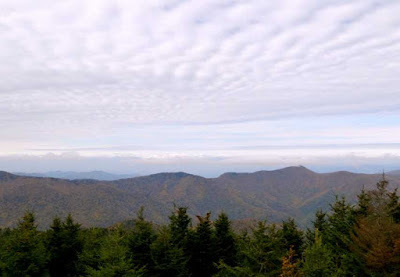 Mitchell State Park on your “getaway to the North Carolina mountains” to-do list, there’s much more than just driving up, parking, and checking out the observation deck on the tallest peak in the eastern United States — there are some great hiking trails there as well. So, pack a picnic lunch and some water, bring layers (daytime high temperatures can be in the 60s in the summertime there, cooler at other times of the year), and set out for a day outdoors. The Black Mountains include Mt. Mitchell (just over 6,680 feet above sea level) and five of the other ten tallest peaks in the eastern U.S. The second highest peak, Mt. Craig, is about a mile away from Mt. Mitchell and not much shorter than it’s neighbor, standing 6,647 feet tall. A rugged hiking trail called the Deep Gap Trail connects the two peaks, and actually goes a few miles further along the crest of the Black Mountains. Starting at the picnic area on the summit of Mt. Mitchell, the Deep Gap Trail showcases the spruce and balsam fir trees that give the peaks above 6,000 feet that will make you feel like you are in southern Canada as opposed to the southern United States. Mt. Mitchell State Park is also home to diverse and endangered species of plants, so hikers are encouraged to tread lightly and stay on the trail. Note that there are some steep sections along the Deep Gap Trail between Mt. Mitchell and Mt. Craig, and the hike is considered moderate-to-strenuous. In addition, the weather can “change on a dime” as we like to say, so just to be on the safe side, prepare for cool and warm temperatures, rain, sun, and wind. Rain clouds and fog can come in quickly, and leave just as quickly. Also, for your planning purposes, Mt. Mitchell State Park is typically closed to road traffic from November through April, when snow and ice is possible. When you stay with us at the Inn on Mill Creek B&B, ask us about trail maps for Mt. Mitchell — we have them! This entry was posted in Blue Ridge Parkway, Hiking and Waterfall Trails and tagged Black Mountain Range, Blue Ridge Parkway, hiking, Mt. Mitchell, outdoors, Summer by Inn on Mill Creek. Bookmark the permalink.